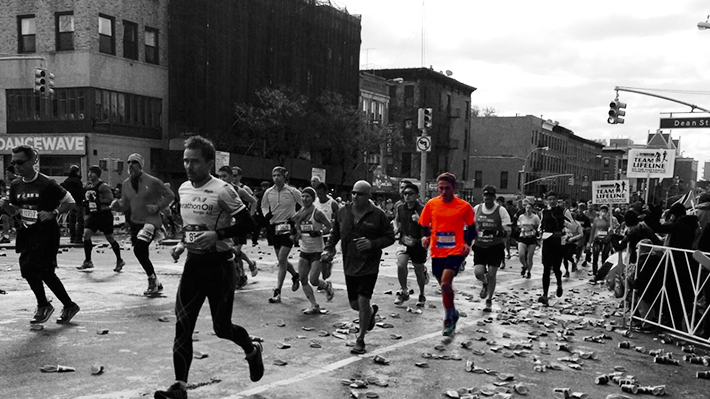 Sean Lewin stood in a sea of perfect strangers, ready to run his first New York City Marathon. As he awaited the start of the race, he felt a bond with the runners pressed in around him like a subway car at rush hour. Crowded as they were, the shared prospect of running a grueling 26 miles on a chilly, windy day in November made them feel like a team. Sean grew up in Manhattan and often watched the marathoners from his apartment as a child. Competing in the race was a lifelong dream, and though it was his first full marathon, the support of family and friends spread along the course kept his energy high. It wasn’t until he crossed the Queensboro Bridge, where no spectators were allowed, that he “hit the wall” and felt fatigue set it. His training helped him endure, and the enthusiastic crowds gathered in Central Park rallied him to the finish line in just under four hours. After reuniting with his family, they headed for their apartment through a mass of runners exchanging congratulations. The shared experience had bonded them and made the crowd feel like family. The feeling of near-instant kinship on race day had some parallels to Sean’s time in the Business Learning Community (BLC). Spending his freshman year in the community was an experience he likens to being in a “one-year fraternity” and recommends to friends entering college. Sharing living space in Myers Hall with about 40 other students presented its challenges, but taking the same courses, studying for the same tests and facing the same challenges created strong bonds the business law major values to this day.